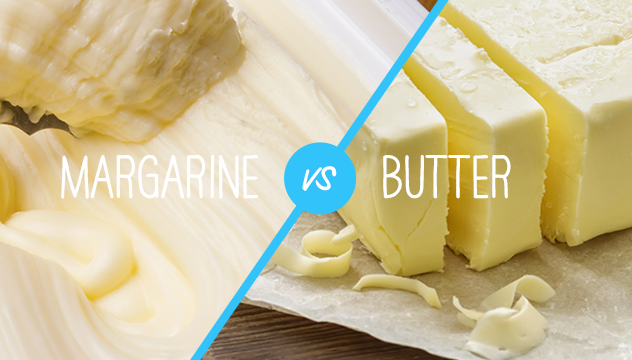 Margarine is a healthy alternative to butter. Although margarine is thought to be a healthier option than butter due to the fact that margarines are lower in calories and saturated fat; these products are made from hydrogenated vegetable oils that may contain up to 2.5 grams of trans-fat per tablespoon. Currently, the American Heart Association recommends limiting trans-fat to zero or less than 1% of your daily calories- which is about 2 grams for the average person on a 2,000 calorie-per-day diet! So while butter does contain 7 grams of saturated fat per tablespoon, cream is the sole ingredient which contains 0 grams of trans-fat. Therefore, in moderate amounts, butter can be a part of a healthy diet.